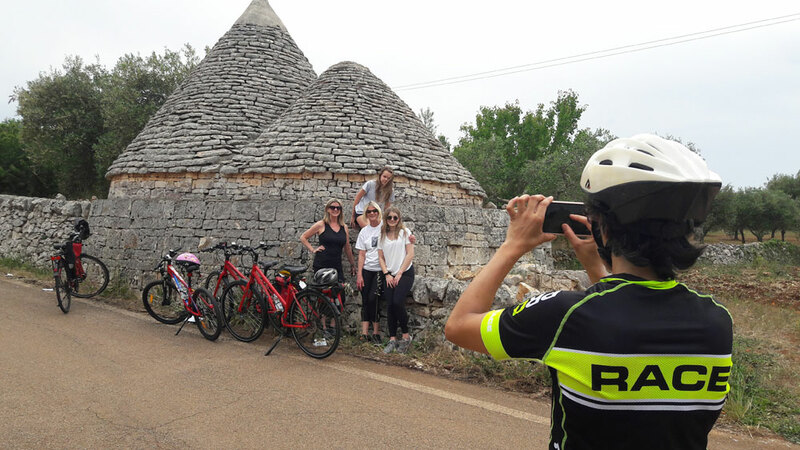 Cycling by the sea and through the hills of the Alta Murgia, among the UNESCO world heritage sites of Apulia and Basilicata. Visit Trani, with its port and splendid cathedral and Castel del Monte, with its mysterious, octagonal-shaped castle built by Frederick II. After crossing the Bradano Valley, on roads surrounded by hills of corn, head for Matera, with its ancient Sassi, dwellings dug out of the rock. The journey ends in the Itria Valley, among the trulli of Alberobello and Ostuni, the “white town”. The tour unwinds largely on secondary roads with little traffic. Mainly on asphalt that is suitable for road bikes. The area is predominantly hilly with short, easy climbs near some of the towns. Individual arrival in Trani and get settled in at your Hotel. Free time for visiting this old city with its beautiful historical centre, the Romanesque Cathedral overlooking the sea, the Swabian Castle, the historical buildings, the gardens and the port, where we recommend you taste some fish for dinner in one of the many restaurants. 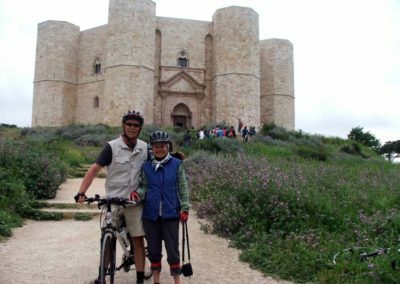 Your trip begins crossing the Alta Murgia countryside, not far from Castel del Monte, surrounded by olive grooves and vineyards. Before the end of your ride you will visit the Castle of Frederick II, an amazing site, in the list of UNESCO heritage sites, which is unique of its kind. Leave the marvellous meadowlands in the park and head on to the valley until you come to the town of Gravina di Puglia, along semi-deserted roads where time seems to stand still. The town, which dates back to the 8th century B.C., unfolds over the centuries with amazing evidence of the various civilizations. Don’t miss a visit to the underground town and historical centre. 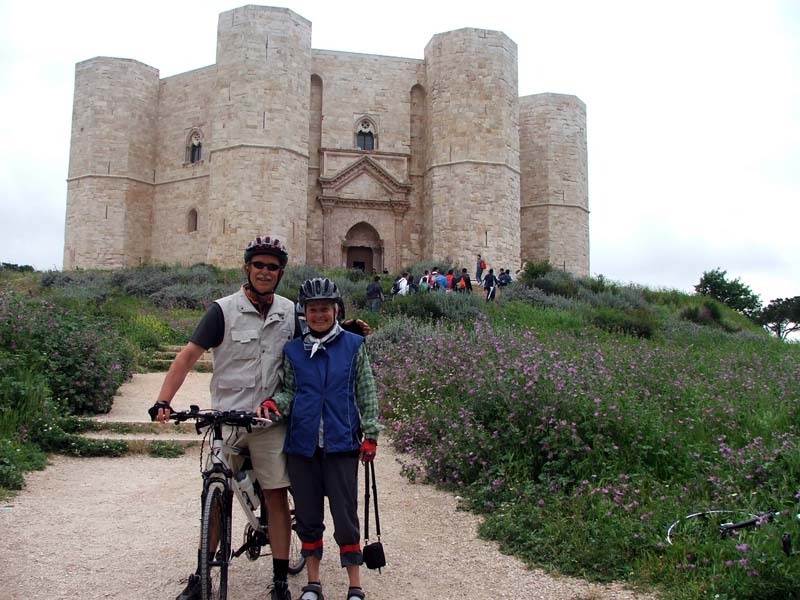 Cycle to Altamura, famous for its splendid cathedral and bread. 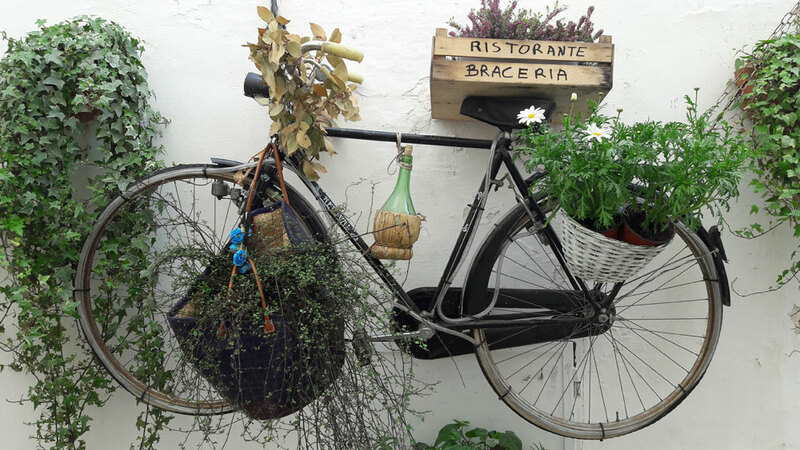 Discover the streets in the historical centre, beneath the cathedral bell-tower and taste some fresh focaccia baked in an old wood-burning oven. Set off again for the countryside towards the built-up town of Matera, which is just a few kilometres away. Arrival in the old part of the town called the “Sassi” and accommodation in a hotel in the historical centre. Don’t miss a visit to the rock churches and city’s museums (ask your local operator for a private guided tour). Grade: Easy route with short climbs at the end of the day. Enjoy a relaxing day visiting the city of Matera. A leisurely walk will enable you to visit: museums, rock churches. Alternatively, you have the choice of two routes that give you the chance to explore the surrounding area. Follow the beautiful, deserted road around the San Giuliano Lake, a peaceful wildlife reserve for migratory species from Africa. Stop to watch the herons, cormorants, storks and ospreys. A stop-off at the lake is recommended for a picnic. Don’t miss a visit to the Crypt of Original Sin. To reach the crypt, a natural cavern that falls sheer to the “Gravina di Picciano”, cross the silent path of Pietrapenta, through cornfields and vineyards. This fascinating rock oratory represents one of the oldest examples of rock art in the South of Italy. Its extraordinary cycle of frescoes painted five hundred years before Giotto, highlights the typical features of Benedictine-Beneventan art (8th -9th centuries). Payment on entry (8 euros per person) and subject to booking. Return to Matera back up the hill. Grade: moderate, with a long climb at the end. Return to Matera and overnight stay. 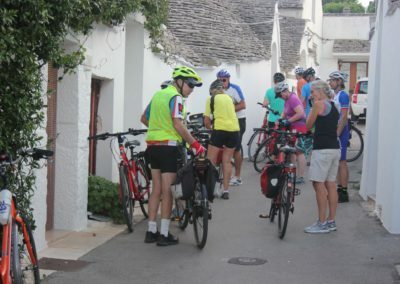 Breakfast and departure for Alberobello. 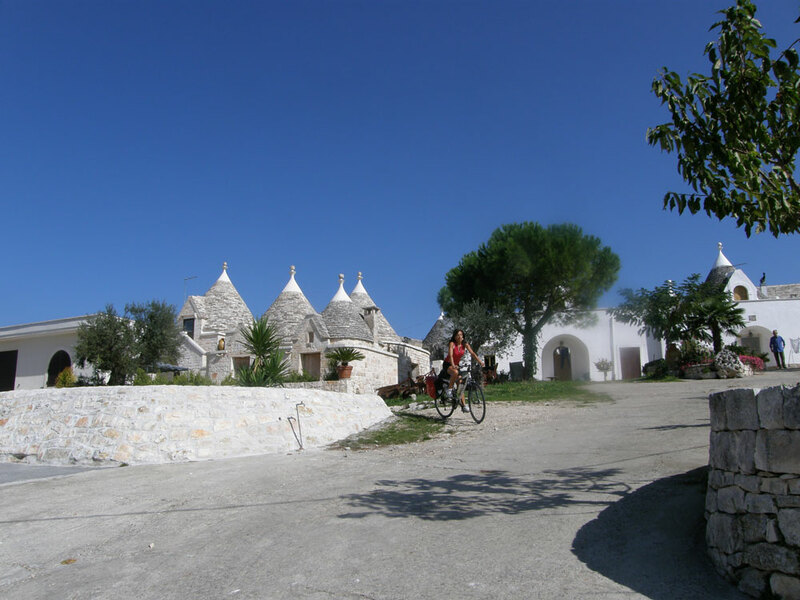 Go through the towns of Gioia del Colle and Noci until you reach Alberobello. Accommodation in aTrulli complex dating back to 1600, in the historical centre of Alberobello, which is included among UNESCO’s world heritage sites. 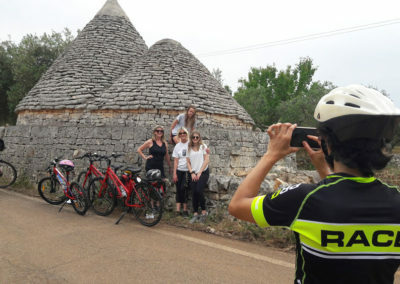 Cycling trough the Selva (forest) near Fasano, you follow the Adriatic coast and reach Ostuni, which is reputed an architectural jewel, and is commonly referred to as “the White Town” for its white walls and its typically white-painted architecture. 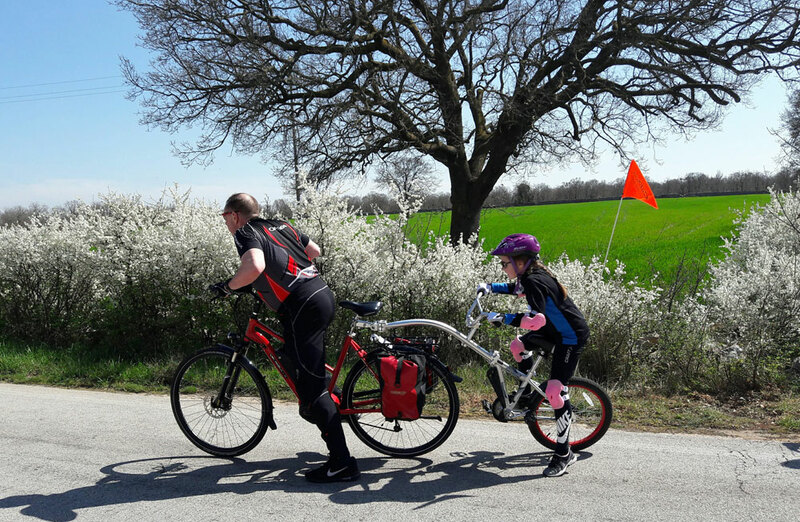 Characteristics: 6 days by bicycle on hilly terrain of easy to medium difficulty. Total length: 300 km, with stages from 40 to 69 km to be done in 4 – 6 hours within the day. 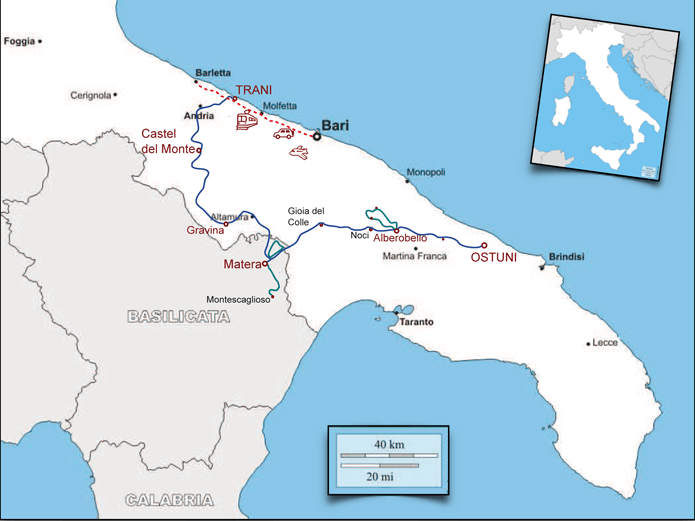 Railways: Trani and Ostuni are well connected to the national railway service. There are also other local railways (Gravina, Altamura, Gioia del Colle, Noci and Alberobello) along the way. 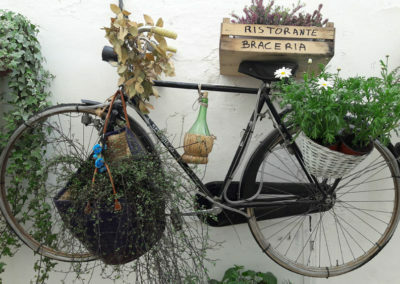 Bicycles travel free on trains in Puglia! Wednesday and Saturday from March 15 to October 25. Medical/Luggage insurance, minivan assistance (available for small groups upon request), drinks, lunches and dinners, entrance fees, tips, personal extras, everything else which does not come under the heading “the fee includes”. 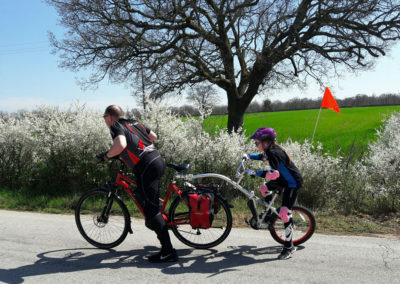 Hybrid bike rental with 27 speed (Shimano Deore gear) with rear pack frames and side bags: € 80,00 (7 days). Cost of ticket: € 3.00. Various tours ranging from 15 mins to approximately 2 hours with a chance to sample the different wines in cellars. An unusual tour of the Sassi, a UNESCO world heritage site, to discover the hidden city. Set off from Piazza Vittorio Veneto to visit the city’s two treasures of Romanesque art: S. Giovanni Battista (1233) with its classical, figured capitals, and the Romanesque cathedral (1270), with its impressive façade embellished with a splendid rosette. The road down to the Sasso Caveoso begins at the top of the Cività, the ancient, medieval citadel surrounded by tall defensive ramparts and noble buildings, along a scenic route that unwinds through squares, steps and alleyways, which often run over the roofs of houses. This takes you to the rock church of Santa Lucia alle Malve (11th century), a splendid example of negative architecture: niches, apses, domes and capitals…created by digging a space out of solid rock. Next we come to a typically furnished cave-dwelling that was inhabited until 1956, which dates back to 1700, and a craft shop dug out of a cave. Also the seventeenth-century cellars, some of which are up to 100 metres deep, are hypogeums. Finally, stop off in a bar, in the Sassi for refreshments after the walk and to get an idea of how the cave dwellings have been renovated and rearranged today. Time max 3 hours, excluding entrance fees. The Crypt of Original Sin can be visited from Tuesday to Sunday, prior to booking. MUSMA is open from Tuesday to Sunday, from 10 am to 2 pm and from 4 pm to 8 pm. From November until the end of March it is only open in the morning: from 10 am to 2 pm.